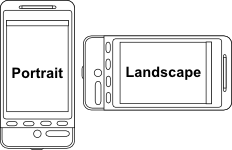 When developing an Android app the Activity screens that form the user interface can be viewed in both portrait and landscape modes. 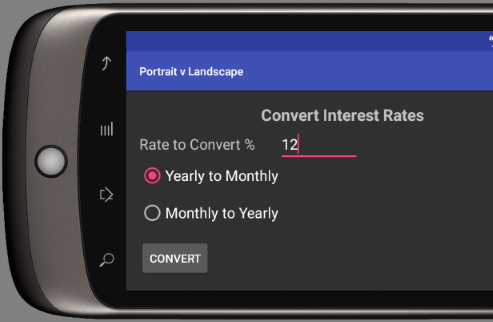 Since Android devices (phones and tablets) can be used in either orientation screen support for both is helpful to the user. 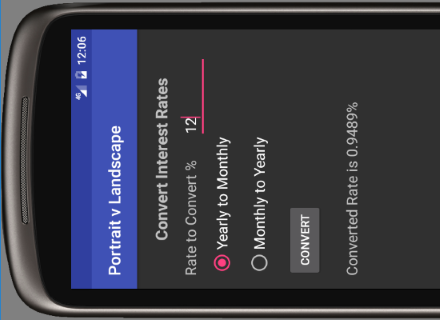 Do this by building layouts for each mode, alternatively design the portrait layout and then wrap it in a ScrollView. Here is a screen from a simple app. 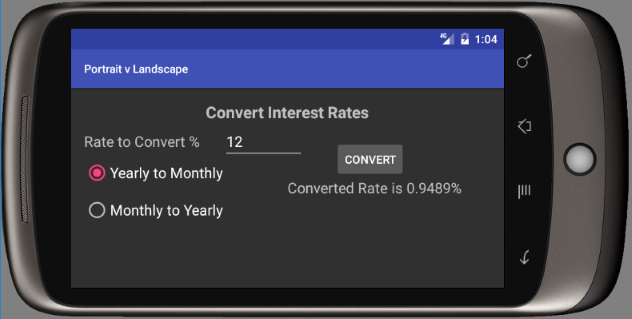 The app converts a loan's annual interest rate to the monthly rate and vice versa. The screen is on a 480 by 800 high dots per inch (HDPI) screen. The widget text size has been set to 18sp (scaled pixels). When the device is rotated (Ctrl-Left Arrow on the emulator) the last TextView on the screen is no longer visible and is not accessible. 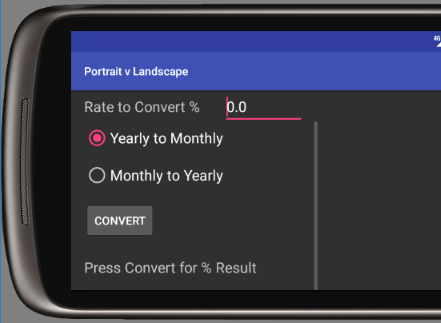 android:text="Press Convert for % Result"
Restrict the app to use only portrait (or landscape) screens via the Android manifest file. Drop the portrait design layout into a ScrollView. Android can be restricted to not switch the screen to landscape when rotated. Open the AndroidManifest.xml file, in the activity declaration element add the attribute screenOrientation and set it to portrait. The screen will no longer rotate when the device is turned. The previously hidden TextView in landscape orientation can be scrolled into view. 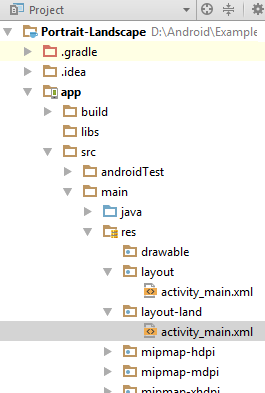 Then change the copied file, in this case activity_main.xml, in layout-land to suit the landscape orientation. This is the modified layout file XML. The great thing here is that there were no code changes required to support the landscape orientation, only copying and reworking the original portrait screen design. 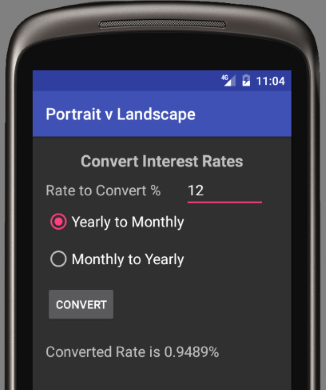 The code is available in portrait-landscape.zip for download with an instructions.txt on how to import the project into Studio. psingh on Feb 08, 2017 at 7:40 am said: Really good post, anyone can easily learn.